Notts 447, Sussex 11-3: Riki Wessels wiped away some of the demons of last season with an exhilarating career-best knock of 202 not out, as Nottinghamshire tucked into an inexperienced Sussex attack on the opening day of their Specsavers County Championship match at Trent Bridge. Wessels plundered his runs from 177 balls, hitting 22 fours and seven sixes, to help his county to 447 all out before Notts’ much-vaunted bowling unit reduced Sussex to 11 for three from the final six overs of the day. 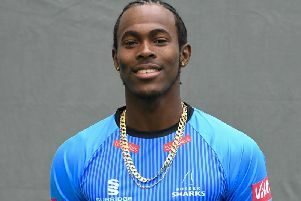 Dropped for the final four matches of last season, after only averaging 25 with the bat, 31 year old Wessels scored his runs all around the wicket and made Sussex pay for dropping him on 47, with first slip Harry Finch grassing a regulation nick off Jofra Archer. Steve Magoffin, on the ground where he took 12 wickets in a losing cause in 2015, was the most successful bowler for the visitors, taking five for 51 but when he left the field, an hour after lunch, batting became much easier for the home side. Magoffin had dismissed Greg Smith and Samit Patel in his opening burst, after Sussex captain Luke Wright had opted to bowl first. Smith was smartly taken at gully by Laurie Evans for eight and Patel feathered a catch behind for only four. A quickfire 45 from Alex Hales, made from only 39 balls with five fours, was the chief catalyst for Nottinghamshire’s fightback but he and Jake Libby, who scored 21, went in the same Archer over. When Michael Lumb edged Magoffin to gully, the home county had slipped from 83 for two to 88 for five in only eight deliveries. Riki Wessels and Chris Read added 54 either side of lunch but their partnership was ended by another fine bit of bowling from Magoffin, who got one to nip back and take the inside edge on its way to bowling Read for 30. James Pattinson made just 12 runs on his home debut for Notts, caught behind to give Magoffin the 27th five-wicket haul of his career. The tall fast bowler left the field at the end of his spell, allowing Wessels to take the spotlight, although Stuart Broad also staked a claim for the batting honours as he reached a second successive 50 in the championship before being bowled by Stuart Whittingham for 57. Broad’s knock included nine fours and a six and he helped add 132 with Wessels in only 15.4 overs. With their main strike bowler back in the pavilion Wright rotated the rest of his four-man attack, Archer, Whittingham and debutant Adam Barton – a trio that boast just 22 first class appearances between them. Wessels was particularly savage on anything dropped short and an unforgiving short boundary meant that runs flowed almost effortlessly at both ends. Archer’s figures of three for 155 came from 27.5 overs, whilst Whittingham took one for 88 from 10 overs, with Barton leaking 81 from 11 wicket-less overs. Stiaan van Zyl had better fortune, trapping Luke Fletcher lbw for 25 but no-one could tame Wessels. His seven maximums included two scoops over the long leg ropes off Barton and a mighty heave into the pavilion off van Zyl, securing Notts maximum batting points in only 71 overs. After two stoppages for bad light Wessels went past the 199 he scored at Hove, against the same opposition in 2012, to record a deserved double-hundred from 170 deliveries. A fairly forgettable day for Sussex ended with their first innings in total disarray as Pattinson and Broad snared three wickets in just nine deliveries. Pattinson removed Chris Nash lbw for one and sent the stumps of nightwatchman Whittingham cartwheeling out of the ground. In between, Broad ended Finch’s short stay on one, thanks to another successful leg before wicket appeal.